A few weeks ago, one of my friend asked me whether I am into Forex trading, according to him, he is currently earning small sum every week via an "automated" Forex trading tool (or mobile app). Being completely newbie to Forex and just started stock investment not long ago, my answer is "not at the moment". Of course, regardless which investment/trading vehicles, you can still make or loss money, ultimately it is dependent on your risk appetite as well as the vehicle that you are comfortable with. This reminded me two gurus that I've interviewed before in my "Interview with peer investors series" whom specialized in each of these vehicles. They are Alvin Chow of Big Fat Purse (click here for the interview post) and Ezekiel Chew of Asia Forex Mentor (click here for the interview post). Both of them are conducting their respective regular workshops for the keen learners. Oh, by the way, Alvin's next Value Investing Mastery Course (Stock) is on 25th April 2015 (Sat) and Ezekiel's next AFM Forex Trading Course (Forex) is on 9th and 10th May 2015(Sat/Sun). To find out more of their respective workshops, click on their course names above. To each its own but there is no harm learning new knowledge/skills that potentially earning us more money. Some pple will need to learn from themselves to find the truth behind those Ads of Easy and Automated Art of Making Money from the market. No harm if only if they lose a few months of salary. But if they lose a few years of their salaries and locked in losses in their late 50s or 60s. They may need to meet their Gu Shen to recover those losses. Some pple after a few years in the market feel they have elevated to Shens in the market. CW8888 : totally agreed with you.. We all need to invest prudently. Ken : hahahaha, thanks thanks.. Read one of your post already. Ok, do write your review, of the book, once done and share your findings. 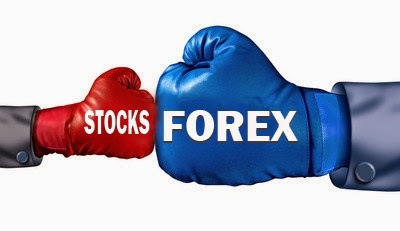 Suggesting picture when it comes about the difference between stocks and forex market, I guess that the reason for foreign exchange market being the largest market in the wrold it would be because it is an intangible one. EA Builder : Thanks for the comment. The forex market is the largest, most liquid market in the world with an average traded value that exceeds $1.9 trillion per day and includes all of the currencies in the world. Hi Nancy, thanks for dropping by and provide valuable comment.